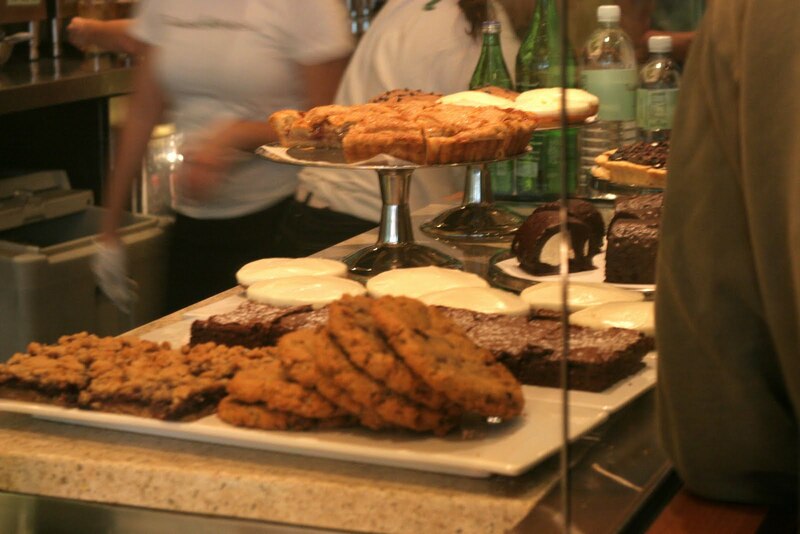 I first tried Tender Greens a couple of years ago when it first opened in Culver City and fell in love with the concept of fresh salads and proteins prepared right in front of your eyes. 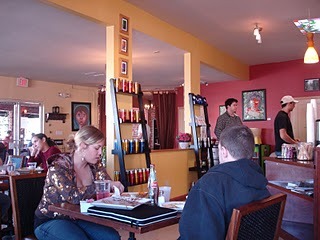 I was happy when one opened up near my office, and yesterday my friend Dmitri and I decided to go for lunch. The place was packed at 12:45pm, and it’s easy to see why- Tender Greens is a mecca of healthy, delicious options that are all reasonably priced. I opted for something I get often- The Happy Vegan- not because I’m vegan, but because it’s damned good and I’m a whore for hummus…a Hummus Whore, if you will. 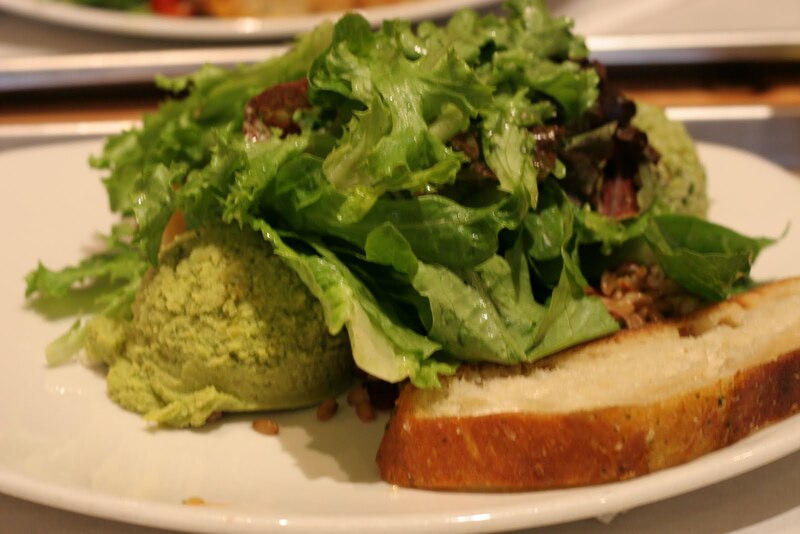 For around $10 you get a gigantic green salad dressed with a sherry vinagrette, a scoop of edamame hummus, another of tabbouleh, yet another of red quinoa and yet another (I know, wow right?) of a particularly delcious farro salad with toasted hazelnuts and dried cranberries. It’s always way too much for me to finish but I love the different flavors and textures this dish offers. Too bad I didn’t lift up the green salad veil to reveal all of the elements on my plate…but you get the idea. Actually, here is a better photo from another blog. My not-so-great pic of the Happy Vegan! At least I can take heart in knowing that I’ll be returning to Tender Greens many more times and will have another opportunity to get that sandwich. Actually there are quite a few things I’ve yet to sample so I’m looking forward to my next visit. Want a cookie the size of my head to totally take the “healthy” out of that salad? Another short post but wanted to get this out there, especially if you live/work in the Hollywood area as I do (work, not live!). I very rarely leave my building for lunch and instead enjoy my lunch straight out of a Tupperware in front of the warm glow of my computer screen. However, I know it’s good for the soul to pry oneself from their office and get some sun once in awhile, so my friend B and I decided to actually eat out the other day. Nestled in the heart of Hollywood, my eating options are either Shintaro sushi or something in the Hollywood/Highland shopping complex. Although the food at The Grill is good, I don’t normally like to fork over $20+ for lunch. Shintaro is probably my first choice for a lunch out, but I drive past a really cute crepe place every morning that has piqued my interest for awhile now. 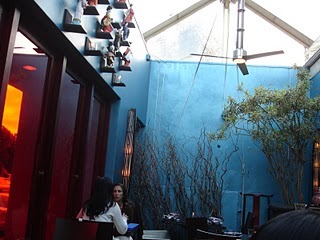 It’s called Solar de Cahuenga and it’s just one of those places that you think “I HAVE to try it sometime!” but haven’t gotten around to. Well, I’m happy to say that I finally did, and I’ll be back again soon. The coffeehouse vibe is a great way to escape the workday, and their system makes it easy to have a fast lunch. Walk up to counter, place order, get your number and find a table. 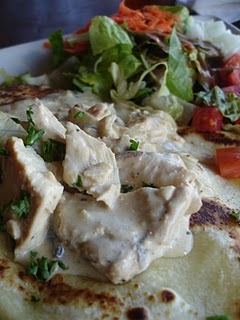 I ordered the Sunny Path – grilled chicken breast, sautéed onions & button mushrooms in a rich Dijon sauce crepe- which was filled to the brim with the creamy mixture. It was delicious and I was pretty surprised at the large portion. 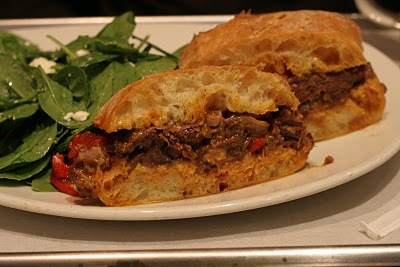 My friend B got Susie’s Own – lean ground beef sautéed with sweet onions, red bell peppers, spinach, nutmeg & chopped hard boiled eggs finished with marinara sauce- which wasn’t quite as successful- it wasn’t bad but it had nutmeg in it which I thought was odd with the beef. 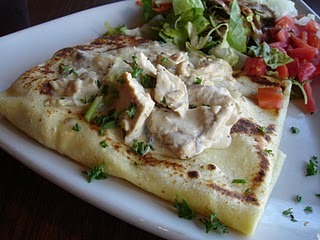 Also, I’d rename it The Kitchen Sink Crepe if I was them. Honestly- it just had too much stuff going on. He devoured the whole thing anyway. 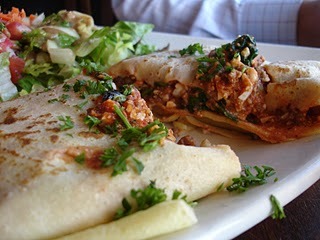 Solar de Cahuenga offers lots of breakfast items, sandwiches, panninis, crepes, coffee drinks and lots of sweet goodies. 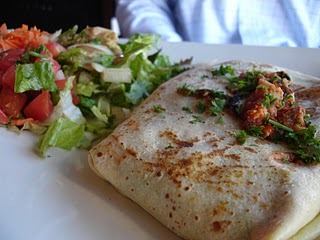 It might not be the most authentic in crepes, it’s still nice as a fresh lunch option. I’d like to go back and try some of their sandwiches which looked very good from afar. I know, I know- it’s my fault for even considering going to a place that seems to be a mish-mash of all Asian cuisines, but a friend was in from out of town, we all craved Chinese food and we were in West Hollywood. Unfortunately, we weren’t really close enough to Alhambra, San Gabriel or Monterey Park (or even the second-best China Town, for that matter) and we were hungry for something spicy. 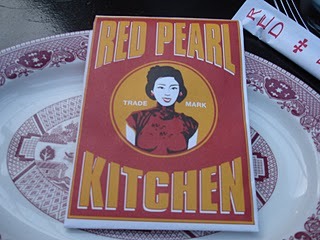 Maybe it was our growling tummies that made us choose to go to Red Pearl Kitchen- a hipster, trendy, barely-Chinese restaurant on Melrose. Besides, the gorgeous design would impress my out-of-towner friend, right? Anyway, it was a visit that we all regret and I will never make that mistake again. I really, REALLY should have known better than to dine at a place that has pad thai, spicy tuna on crispy rice, a Kobe beef hot pot (?!) and General Tso’s tofu all on one menu. We drive up to an all-female team of valets, which I thought was pretty cool. Walking into the restaurant, we were impressed by the Asian-fusioned decor. I did get a bit worried, however, when I realized that we were one of only two tables in the entire restaurant, and it was 7:30 PM. Regardless, I told the hostess about my reservation (which I had made on Open Table) and she promptly seated us in the enclosed patio, which again, was quite lovely. 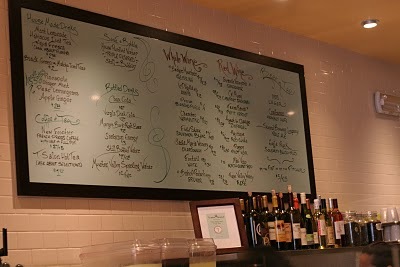 Our very cheerful and helpful waitress took our drink orders, we perused the menu, then decided on a few things to share. I’d say we were off to a good start. First up: Baby Greens with Sesame and Soy. 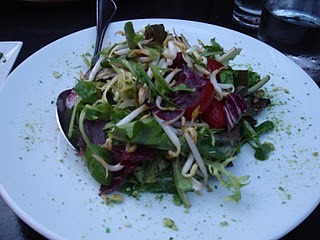 Bland, bland and bland- a pile of mixed greens were barely dressed with anything remotely resembling soy or sesame, but the vegetables were fresh. It just lacked any decipherable flavor. 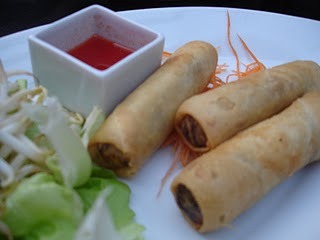 Our veggie spring rolls arrived, looking nice and crisp, but they, too, were bland, and the accompanying red sauce didn’t have any flavor either. I detected some five-spice in the actual spring rolls but it just didn’t go well with the vegetables inside. 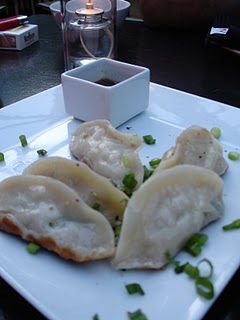 Then our Ginger Chicken Pot stickers arrived- nice and golden brown on the bottom- my friend M and I were excited. That excitement quickly faded, however, after I took my first bite and realized that the filling completely mushy. Luckily, I took a look at the inside of my half-eaten pot stickers and figured out why- the ground chicken was raw. Yup. Raw chicken. Unfortunately, M had already popped one in her mouth. My friend JR quickly returned his offending pot sticker to the serving plate. I called the waitress over, showed her the uncooked poultry and she whisked the plate away, apologizing profusely. When I told her that I didn’t want another order, she said she understood but brought another round of drinks, on the house, instead. Smart girl. The meal pretty much didn’t recover after that- we were served what is probably the only fried rice dish in memory that I’ve had to add salt to. Or what I thought was salt- with no salt & pepper on the tables, we had to ask for each. The only salt they claimed they had was mixed with some strong herb, so it wasn’t ideal for adding to all of the dishes. 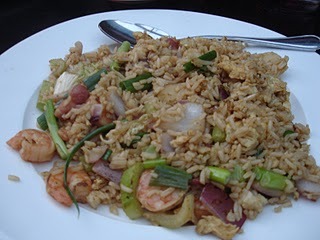 Honestly- the shrimp in the fried rice were like little hockey pucks- in both texture and flavor. Who doesn’t season shrimp?!?! It didn’t contain a single grain of salt, I can tell you that, and were so overcooked that you could probably use them in place of rubber bullets. 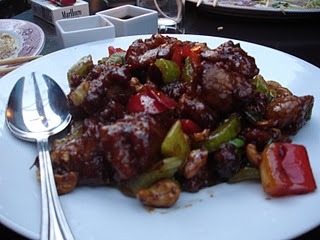 Our Shao Hsing-Garlic Cashew Chicken was so-so but by that point, we were pretty disgusted with the whole meal. We left most of it and decided to stop by Famima for some real food (*chuckle*). Look- I realize that it takes more than one visit to a restaurant to truly get the whole picture of what a place is about, but can one really return to a place that unknowingly served them raw poultry??? I’m not a chef but I do realize that after browning the pot sticker, you put some water in the pan, put a lid on it and let it steam long enough for the filling to cook all the way. Judging by how brown the bottoms were, I have a feeling that the cook thought they would burn so he or she took them out too soon. I suppose if any of the other dishes had been good, I’d have some reason to return, but nothing was worth going back for. The menu is a mish mash of Japanese, Chinese, Korean and Thai cuisine- maybe they should just focus on one thing, although I have a feeling it won’t last long enough to do so. They don’t even give you fortune cookies with your check, although the valet leaves a gingerbread cookie and an almond cookie in your car. Cute. But I want my fortune cookie. To add insult to injury, I checked my Open Table account today to see that they didn’t credit my Open Table account with the 100 points I should have gotten. I think that pretty much is the nail in the coffin.